We arrived at the hotel after a 9 hr+ car trip. My parents set out to check in, and I looked around the huge lobby. I met a cool group of ladies at the table by the bar, including Creatch, Arlene, Jude, and a lot of other REALLY great people. I feel terrible I can't remember everyone's names! You all were so nice! E-mail me and I'll put your name up, okay? Anyways, I went back over when we got the room, and we got the luggage from the car. There weren't any lluggage carts left by that time, so we carried it ourselves. My Dad was left with the brunt of it, and he has a very bad arm and neck. It took a while to find the room. It was in the basement. In another wing. Truly third class...the hallways were narrower, the lights were dimmer, but I didn't care; we were finally at the room! My Mom put in the key card, and opened up the door. "Someone's in here!" she exclaimed. The man in question came up to the door. "Deutch? (sp? ), German?" he said. He couldn't speak English. So we halled all of the luggage about 3/4ths of the way back, and my Mom stayed with it. My Dad went to straighten out the room, and I went to try and get registered. Only I had no idea where to go. A kind con attendee, Sarah Lee, helped me out, escorting me most of the way, and giving very good directions for the rest. Thank you! I could only register for myself, so I went back to find my parents. My Dad informed us that there were no more rooms left (Oh no!! ), so they'd given us a suite at no extra charge (oh yes!!). Thank you German man! We got to the room. It was magnificent. I could live there. Really. More like 7:30-10:30, but who's complaining *g*. The "Bad Boys of Celtic Music," as they are dubbed, were great! I have pictures of me dancing, but I don't want to embarass my self :-�. A lady who came with the Rogues saw that I was following her footsteps, so she danced with me, and that was fun! They played a number of songs. My favorites were "Bonny Portmore," (YAY! ), the one Lars wrote in memory of his dog :(, The Marine Corps Hymn (Ooh Rah! ), and "Amazing Grace." Well, actually all of them were great, I just can't remember their names! BTW, The Grammy-nominated Rogues are, individually, "Wee" Randall Wothke; Lars Sloan, the Great Dane; Jimmy "the Rock" Mitchell; and Bryan Blaylock, "the Belligerent" . During intermission, Creatch came over to chat. We spotted THE BOB (read: Robert Chapin, fight coordinator, choreographer, consultant, instructor, and performer of feature films Hook, Armt of Darkness, Renaissance Man, Robin Hood- Men in Tights, Lancelet-Guardian of Time....all around handsome fellow ;)), and upon finding I hadn't met him yet, Creatch dragged...err..escorted me to meet him. :) (Thanx Creatch!) 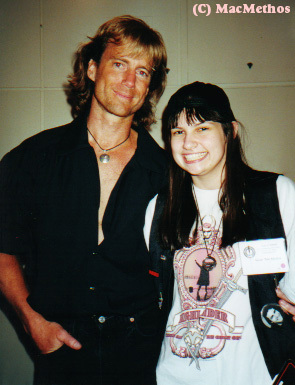 I asked him for his autograph, after Creatch introduced me, and informed him this was my first con. He wrote "To Sarah, Welcome To The Family!". Then we got our pics together. Creatch wasn't sure how to use my camera, and I was trying to explain, and Bob said "That's okay, we'll just stand here like this (read: with his arm around me) until your ready" :-D. Then I took Creatch's pic with Bob, and a nice lady offered to take the three of us. Then Ginger read part of Josepha's story, because she couldn't be there in time. Finally, F. Braun McAsh, who wrote a VERY long story (they didn't give him a limit- just told him to write until he stopped), read us a couple chapters of a story about the character he portrayed on HL. It also had Dracula in it (Scary!). Perhaps not the best story for right before bed! It was Braun's first attempt at fiction, and if these snippets are any indication, he did wonderfully! That's it for Friday night. Stay tuned for the rest of the Con.